Path of Exile is a free action role playing game released in 2013 for PC and Xbox One. This is the true sequel to Diablo II. Path of Exile remains at the top of the online action-RPG genre and continually surpasses its own merits, update after update. Admittedly tough design issues detract, e.g. an all or (mostly) nothing economy, inconsistent difficulty most apparent with bosses, and a general balancing towards power-players as opposed to the vast majority. But, the overall experience is extremely replayable, diverse, rewarding, and straight up fun. 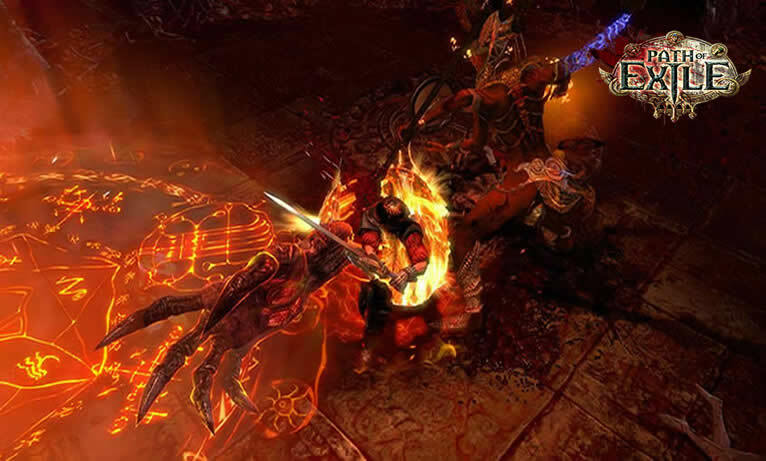 Setting in the dark fantasy world, Path of Exile follows a game-play style that is similar to Diablo series of games. Players control a character from the top down perspective and will explore a wide array of settings that include wilderness/outdoor environments, underground caverns and dungeons. During these adventures players will battle all sorts of monsters in an attempt to complete the game's objectives and many side quests. As is standard in most role-playing games, players will earn experience and equipment as they defeat enemies and complete objectives. It provides robust character creation and customization with seven different classes to choose from and one that is unlocked during game play. Each class is aligned with specific core attributes of Dexterity, Intelligence and Strength but players are not bound to skills specific to one class. They may try to build skills in nearly any discipline. Similar to Diablo, the storyline in Path of Exile is broken into Acts which contain areas to explore and quests. Currently there have been four acts released with more than 70 different areas to explore. There are tentative plans to release 10 acts in the game. The game features both a single player game mode as well as a multiplayer mode. The multiplayer mode allows for up to six players to join up and form an adventuring party. Adding party members does have an effect on game play with increased monster hit points and loot to balance out the additional power of the player character adventuring party. The game is a free-to-play title which provides the option of microtransactions using real money. As Grinding Gear Games states in their FAQ, "Path of Exile is 100% free to play, for everyone forever." The microtransactions offered do cost real money but simply provide in-game perks and cosmetic upgrades that do not offer an in game advantage over non-paying players. Developed by the Grinding Gear Games team and fully capable of playing for free, the Path of Exile captivates a large number of gamers with its successful gaming system and impressive visuals, reaching tens of thousands of gamers, trying to solve the optimization problems faced by advanced players. Remember to buy cheap PoE orbs on U4GM to help you collect the players you want for your team. We are a professional website, which can provide cheap PoE Power Leveling with fast delivery, safe payment methods and best services.